Continuous flotation still has an important role in large-scale wine cellars, and for these needs Della Toffola manufactures its Mod. FLCV flotators complete with one or two practical separation tanks. When it is pressurized, the liquid releases the gas incorporated in the form of tiny bubbles that adhere to the solids and entrain them towards the surface of the separation tank. Inside this tank, a mechanical system is used to remove the lees continuously. The FLCV flotation units are designed to separate the clarified must on one side from the lees on the other, and the lees can then be further filtered using a vacuum filter. 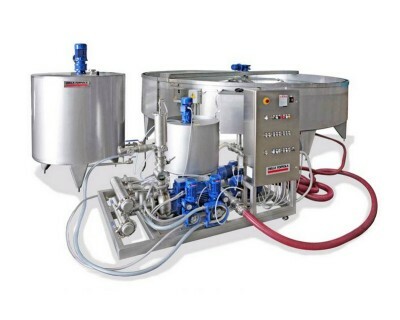 A packaged dosage, saturation and separation unit, installed on an AISI 304 stainless steel frame (optionally also with a bentonite tank) with a product delivery pump and peristaltic pumps for the continuous dosage of bentonite, gelatine and silica sol, and a manifold for mixing the grape must with the adjuvants. Tanks for preparing and storing the adjuvants; those containing bentonite and gelatine are complete with an agitator. AISI 304 stainless steel saturator consisting of a vertical container for dissolving the adequately filtered and measured gas at a pressure of 6 bar. Valves for a precision adjustment of the liquid at the inlet and outlet. Electronic devices for automatic level control. Separate centrifugal pumps for the purified liquid and lees. A round AISI 304 stainless steel separation tank with a flat bottom. The removal of the lees is handled by a revolving system with a variable speed control. The clean liquid is separated at the bottom and then collected in a ring-shaped cavity where the level is adjusted. The clean liquid pours instead into lateral collection tanks from where it is automatically drawn off by the extraction pump. Connections, piping and an electric control panel made of AISI 304 stainless steel. Saturator with a capacity of approximately 2.5 L for assessing the quantity of adjuvant to add to the grape must. Optional extras, turbidity meter and screen.